Flora Fraser examines the papers of George Washington with W&L special collections librarian Vaughan Stanley III. Best-selling historical biographer Flora Fraser visited Washington and Lee on Monday, March 29. Her purpose? Research for her new book on Martha Dandridge Custis Washington and her marriage to George Washington. Fraser toured the Lee Chapel and Museum with Linda Donald, manager of the facility. 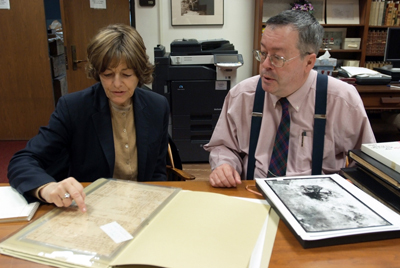 She then visited Special Collections and Archives in Leyburn Library, where, with Vaughan Stanley, special collections and reference librarian, she examined the digital collections of George Washington’s papers. Finally, she toured Lee House with Kim Ruscio, first lady of W&L, and Peter Grover, director of University collections. She also spoke at length with Patricia Hobbs, associate director of University collections, and was impressed with Hobbs’ extensive knowledge of Martha Washington. Fraser, who lives in London, continues a line of famous biographers. Her mother is Lady Antonia Fraser, author of works on Mary Queen of Scots and the wives of Henry VIII. Her grandmother, the late Elizabeth Longford (wife of social reformer Lord Longford), was a renowned biographer of such figures as Queen Victoria and Queen Elizabeth II. Flora Fraser’s best-selling biographies include Beloved Emma: The Life of Emma, Lady Hamilton and The Unruly Queen: The Life of Queen Caroline. She has also written biographies of Pauline Bonaparte and of the daughters of King George III.